The Viking Fishing Division of Sea Harvest Corporation operates a large fleet of fishing vessels and three HACCP- compliant seafood processing facilities. It supplies seafood wholesalers and retailers with a complete basket of quality fresh and frozen seafood products. Founded in 1980, the Viking Fishing Division is built on long-standing relationships with customers, suppliers and employees. 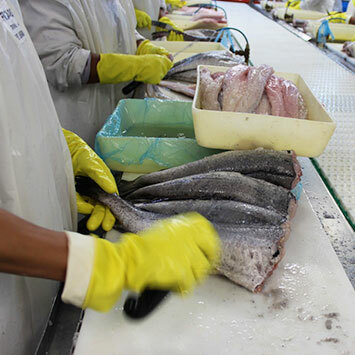 It employs more than 1 400 South Africans across its fishing and processing operations. The Viking Fishing Division has interests in South Africa’s trawl fishery for hake; the small pelagic fishery for sardine and anchovy; the west coast rock lobster fishery and the South African and Mozambican fisheries for prawns. The deep-sea trawl fishery targets deep water hake, Merluccius paradoxus, and shallow water hake, Merluccius capensis, but landings include about 20 other species such as kingklip (Genupterus capensis), monk (Lophius vomerinus) and horse mackerel (Trachurus capensis). The fishing fleet consists of approximately 28 fresh fish trawlers (commonly called “wetfish” trawlers) with an average length of 45m and an average tonnage of 600 tons; plus 30 freezer trawlers ranging in length from 30 to 90m and from 300 to 2 900 GRT. Fishing is at depths of 200 to 800m and otter trawling is the method of fishing. The deep-sea trawl fishery is technologically advanced, globally competitive and by far the most valuable of South Africa’s commercial fisheries. It is certified to the Marine Stewardship Council (MSC) standard as sustainable and well managed. The inshore trawl fishery targets the Cape hakes and Agulhas sole (Austroglossus pectoralis). 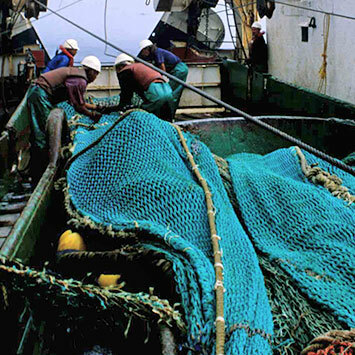 It catches 6% of the global total allowable catch for hake (about 9 000 tons per year). Approximately 30 trawlers participate in the fishery which operates on the south coast between Cape Agulhas and Port Elizabeth. The vessels are smaller and less powerful than those used in the deep-sea trawl fishery; they range in length from 14 to 36m and engine size is restricted to 1 000 HP. The Viking Fishing Division’s Craig Bacon serves on the executive committee of the South East Coast Inshore Fishing Association, SECIFA, a registered industry body that plays a key role in regulating the inshore fishery. In terms of catch volumes, the small pelagic fishery is the largest in South Africa. 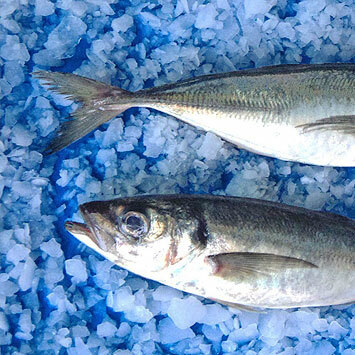 The fishery targets sardine (Sardinops sagax); anchovy, (Engraulis encrasicolus); and red eye – also called round herring – Etrumeus whiteheadi. A small and carefully controlled catch of juvenile horse mackerel (Trachurus capensis) is also taken. Fishing is by purse seiners and occurs inshore, primarily along the Cape west and south coasts (sardine and anchovy) and the Eastern Cape (sardine). Generally, sardines are canned or frozen for human consumption, frozen as bait, or processed into pet food. The anchovy catch is reduced to fishmeal, fish oil and fish paste. The Viking Fishing Division is a leading supplier of boxed, frozen sardines and high quality fishmeal. South Africa’s west coast rock lobster fishery targets Jasus lalandi, a cold-water spiny lobster that occurs from Walvis Bay in Namibia, to East London in South Africa. The catch is mainly taken by traps deployed from vessels that operate in water deeper than 100m. However, in recent years the proportion of the catch landed by small boat (“bakkie”) fishers, using hoop nets deployed in the nearshore region, has grown and now approximates 30%. West coast rock lobster is a high value species that is exported in live and frozen form, mainly to Asia, but also to Western Europe. The Viking Fishing Division processes and packs live rock lobster for export to China. The Viking Fishing Division fishes for deep-water prawns, Haliporoides Thriarthus, in South Africa and Mozambique. 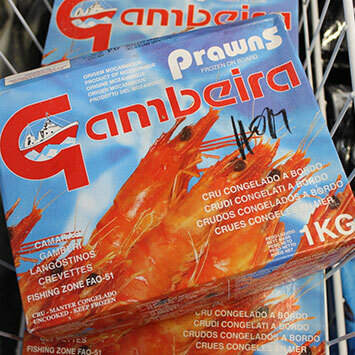 In Mozambique, it operates through a joint venture with a Mozambican government parastatal and markets all its crustacean products under the brand name “Gambeira”. In South Africa, the prawn trawlers MFV Striker and MFV Key Largo also catch red prawns (Aristaeomorpha foliacea); langoustines (Metanephrops mozambicus and Nephropsis stewarti); deep-water rock lobster (Palinurus delagoae); and red crab (Chaceon macphersoni). These and other bycatch species are all processed and packed for human consumption at the Viking Fishing Division’s Durban branch. Cape horse mackerel, Trachurus capensis (locally known as “maasbanker”), occurs along the entire length of the South African coast, with the largest shoals caught over the continental shelf of the Agulhas Bank. Horse mackerel is commonly caught as bycatch in the deep-sea trawl fishery and is actively targeted by companies that hold rights in the midwater trawl fishery for horse mackerel. The species is a popular choice with lower income South Africans who value horse mackerel as a reasonably priced, high protein food. The Viking Fishing Division markets horse mackerel across the entire length of South Africa, particularly in rural areas. It also exports horse mackerel to other African countries, most notably Angola, Cameroon, the Democratic Republic of Congo and Nigeria.